Why Buy A Solid Aluminum Walking Stick? They are machine cut on a lathe. The handles are interchangeable. They are strong and beautiful with a non-intimidating appearance. 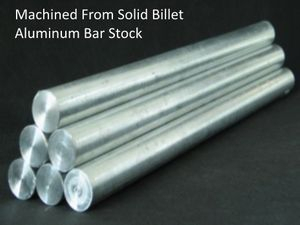 Solid aluminum provides great support for every day walking, and a solid metal bar does not rebound as much as a hollow tube, wood, or composite stick. 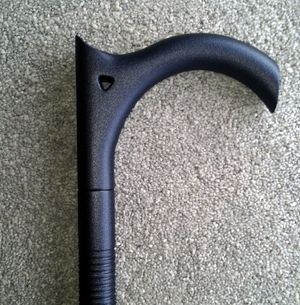 Any one of our multiple handle choices creates the perfect carry anywhere security walking stick. This is my original and most popular design. 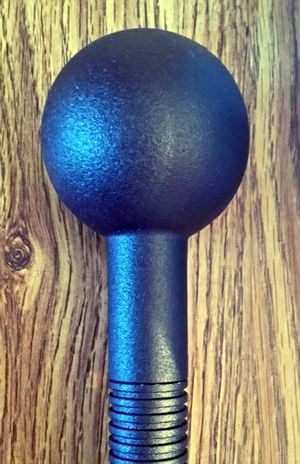 This extremely sturdy knob handle cane is machined from solid aluminum with a tapered shaft and a solid aluminum, machined knob handle. It is a true work of art and very functionally designed for maximum performance. The shaft is 7/8 inch diameter at the handle end and tapers to 5/8 inch at the tip end. There are two sets of shallow grooves machined on the shaft. One set of grooves beneath the handle for quick gripping, and another longer set of grooves on the lower shaft for two handed gripping. We do not cut canes and recommend cutting with a hack saw or with a high-speed metal cutting saw. A slip-on rubber tip comes standard with the cane or any tip that fits a 5/8 inch shaft will work. The Derby T-Handle is forged from solid aluminum, polished and forms an extremely strong and comfortable handle like no other. The shaft is machine tapered from 7/8 inch at the handle end to 5/8 inch at the tip end. The T derby style handle is 4-1/2 inches wide. There are two sets of shallow grooves machined on the shaft. One set of grooves beneath the handle for quick gripping, and another longer set of grooves on the lower shaft for two handed gripping. The cane can be cut to your desired length. We do not cut canes and recommend cutting with a hack saw or with a high-speed metal cutting saw. A slip-on rubber tip comes standard with the cane or any tip that fits a 5/8 inch shaft will work. The Crook C-Handle cane has a traditional crook style handle that is forged from solid aluminum. It has a fully tapered and grooved shaft. The forged crook handle has a wide 4-1/4 inch opening for great grabbing power. The shaft is 7/8 inch diameter at the handle end and tapers to 5/8 inch at the tip end. There are two sets of shallow grooves machined on the shaft. One set of grooves beneath the handle for quick gripping, and another longer set of grooves on the lower shaft for two handed gripping. The cane can be cut to your desired length. We do not cut canes and recommend cutting with a hack saw or with a high-speed metal cutting saw. A slip-on rubber tip comes standard with the cane or any tip that fits a 5/8 inch shaft will work. Our solid forged "edged" C crook handle is a work of art and a masterful design that was inspired by many suggestions and ideas from cane users all over the world, many of whom are expert cane handlers. It is solid, sturdy, comfortable and Very Effective! We took our third C handle design and straight cut the end creating an elongated edge like no other handle on the market. It is only 1/4 inch shorter on the inside curve than our regular C handle although the "cut" makes it look shorter. The shaft is 7/8 inch diameter at the handle end and tapers to 5/8 inch at the tip end. There are two sets of shallow grooves machined on the shaft. One set of grooves beneath the handle for quick gripping, and another longer set of grooves on the lower shaft for two handed gripping. We believe it is simply the finest cane handle money can buy. It is fully polished and anodized to perfection. It comes with a slip on rubber tip. This device attaches between the cane handle and the cane shaft and adds twenty inches of length to form a 56 to 58 inch solid aluminum hiking staff that weighs approximately three pounds. The extension is fully machined, non-grooved, non-tapered and anodized with male and female thread attachments, and matches the diameter of the cane shaft perfectly. Switch from walking cane to hiking staff by simply screwing on the twenty-inch extension. It's just that easy. The extension attaches to any one of our four solid aluminum walking cane handles. This solid machined extension adds two inches to the length of your cane. It screws between the handle and the shaft. This solid machined extension adds one inch to the length of your cane. It screws between the handle and the shaft. Another request from many customers was the ability to form a long Hiking Staff or Bo-Staff. One can now take two cane shafts and join them together using a two-inch solid aluminum "joiner" to form a 70 inch hiking staff Bo-staff that weighs 3 pounds 2 ounces. Our Customers Are Important ! As we progress through our cane project, it becomes apparent just how important our customers are. Many of our new and past products are a direct result of ideas and suggestions from customers and cane connoisseurs and cane handlers. We listen, we learn, we design, we innovate, and we produce! research, design and development, the solid aluminum walking canes are a reality, and we are now completely stocked with all products available to sell globally. These walking canes are one of the toughest, most durable walking canes you will ever find anywhere. It's a work of art, yet simple in design, well balanced, is Not intimidating, and you will immediately notice the 'feel of security' and protection in your hand as soon as you pick it up. walking canes and our thanks goes out to everyone who purchased one and made suggestions. Improvements have been made, and quality is top priority. You simply will not be disappointed. We haven't disappointed anyone yet, and we don't intend to start anytime soon. Our search for the best mined and processed metals and the finest craftsmen has taken us all over the globe and we have now contracted with two facilities in Asia who are producing the finest quality metals, machining and forging we have seen to date. They are excellent, and guaranteed for life! Effective November 2017 - No more titanium canes will be produced until further notice.